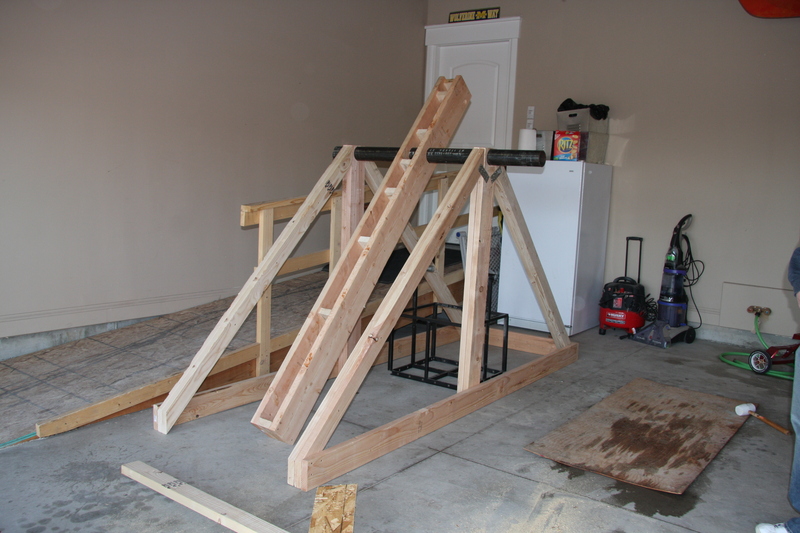 We had our first test of the trebuchet with the full 600+ lbs of concrete, and well it a huge… Well just see for yourself! This was the very first toss! Photo sequence provided by Irotras! Thanks for the awesome shots! I don’t know how far it went exactly because we were so busy tossing the next pumpkin, but by my estimates the really heavy pumpkins (about 15+ lbs) were going about 100 ft. and the small pumpkins (about 6-8 lbs) were going about 200 ft. That’s good, but it can be better! One thing that was clearly evident in watching the trebuchet is that there is too much friction in the throwing arm and main axle joint. I have some video that was taken with a real video camera, and once clean it up I will post that. I would like to thank every one that helped me out on this project, specially my wife for being understanding and listening to the days and day of technobabel. So in explaining on how to size the primary axle, I realized something. 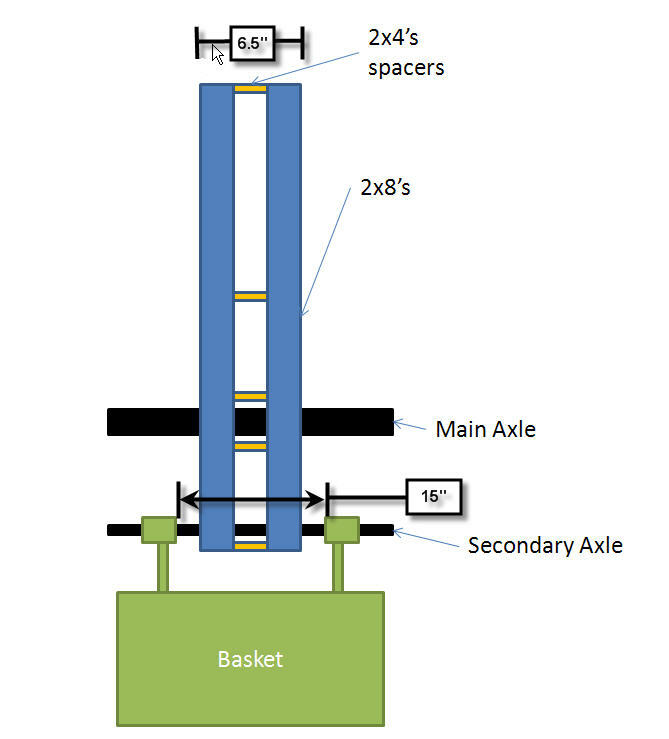 The same force that the primary axle experiences will also be experienced by the secondary axle! This is bad, considering that I was planning on using something a lot smaller on the secondary axle. However, this is not a complete disaster! We had a couple of different options. So that’s what we did! Instead of having the two 2×8’s right next to each other we decided that we would put a 2×4 in between the board in order to space out the forces that the 2×8’s are putting on the secondary axle. The forces are acting on the basket, throught the axle to the throwing arm. The closer we bring the 2×8’s to the basket arms the less of a moment arm there is, which means less bending. Just think for a minute. We’ve all seen those large cat machines and all of those joints are made in a similar fashion to how we are making the basket joint. If we look at the figure below the pin there is a tremenous amount of forces on that pin, but it completely in shear forces, and not bending. 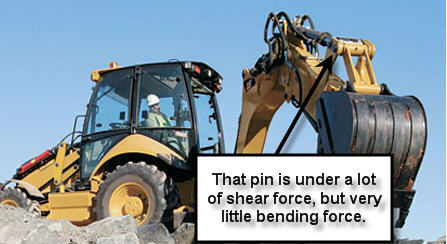 It’s a lot easier to deal with shear forces, than it is to deal with bending forces. So that what we did by separtating the beam and distributing the forces. This weekend we had a strong surge and are very close to completing the Trebuchet! A very special thanks to all of the those who helped! 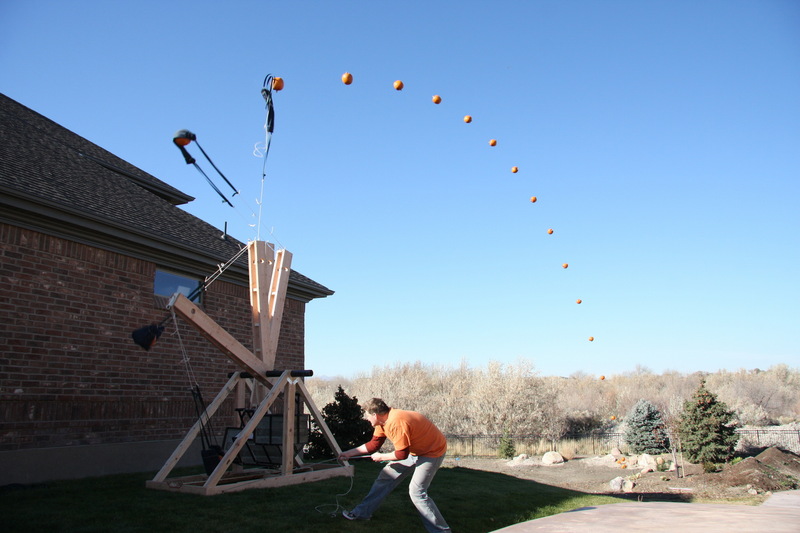 In order to reach our goal of throwing a 6 lbs pumpkin the length of a football field we need to have a counterweight 100 times bigger. So that means we need 600lbs of something. Well, we looked around but couldn’t find anything that was dense enough, cheap enough. Lead would be ideal, but where do we get 600 lbs of lead, and who wants to work with lead anyway? of cement. This translates into 1.58 ft or approximately 20 inches on each side. 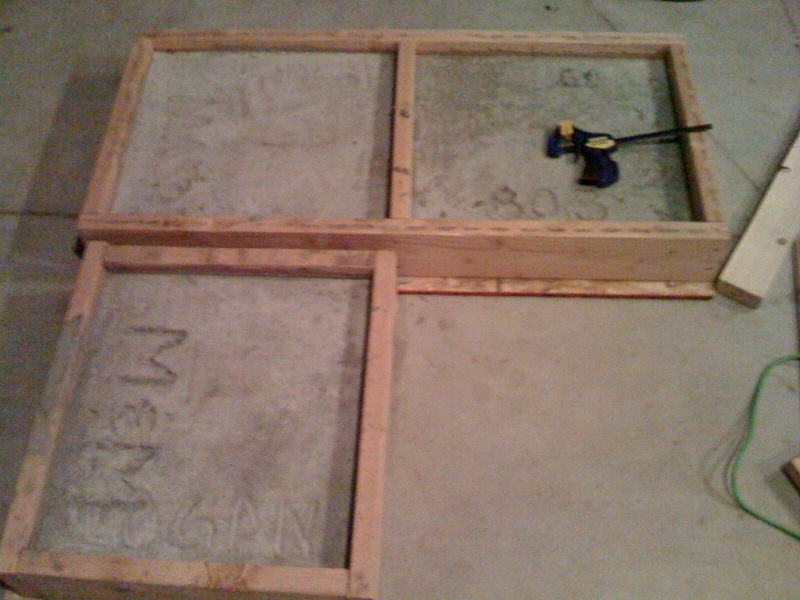 Our cement blocks are going to be 21.5 inches wide, and 19.5 deep, and 4 inches high. We did this so the the cement blocks wouldn’t interfere with the throwing arm when the trebuchet arm is cocked back. It will make sense once I get a picture up of that. Anyway… here are the remain 3 blocks of concrete that are needed to make up the counterweight.